Trash along the outside of a home’s fence-line where wind had blown it. After photos were taken, the trash was picked up. “Trash for Treats” is a local project started by Steven Armstrong that includes a drawing for a prize. The prize for the lucky winner of the drawing will be two passes to see a Cincinnati Reds baseball game in a suite with all food and beverages included. Other participants will receive gift certificates for a free scoop of Whit’s frozen custard. Armstrong was inspired after seeing a post on Facebook by Scott Hammond. 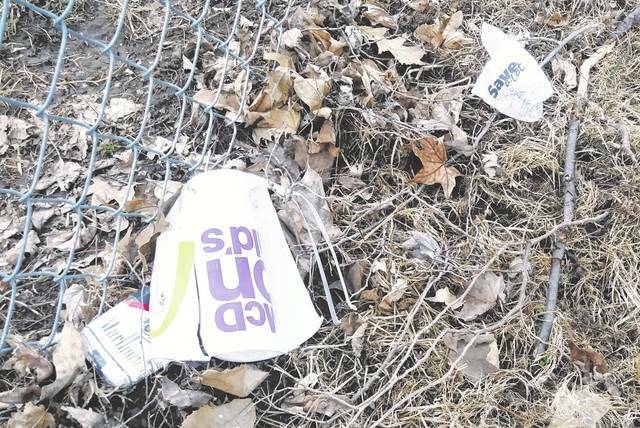 Hammond had been talking about the accumulation of trash in the community, and encouraged people to fill one Kroger bag full of trash and post a picture of it. All submissions must be in by 4 p.m. this Sunday. The winner will be announced at 9 p.m.